"With Solvay 360™ we found the perfect partner." A common approach by Amann Girrbach & Solvay Dental 360™ - highest demands in product quality. Without any compromise. The Amann Girrbach company is the first and so far only validated dental system partner of Solvay Dental 360™ to enable the fabrication of metal-free partial dentures. What are the details of the cooperation? Here we have an ideal division of work based on the respective core competencies of the two companies. Solvay Dental 360™ with its materials expertise in the field of high-performance polymers clearly focuses on materials development. Amann Girrbach is primarily responsible for the CAD/CAM-based implementation, i.e. the consideration of design-specific parameters and the technical milling requirements. Jointly we validate the entire manufacturing process as well as defining the training contents so that the user is guaranteed successful working right from the start. How did this cooperation arise and what strategic direction is it based on? We have been focusing on 100% CAD/CAM-based production for the fabrication of partial dentures for a prolonged period and did not want to pursue any solution approaches that would in turn again result in greater manual efforts by the user. So far, however, we have lacked the perfect material for this purpose. With Solvay Dental 360™ we have found a partner who, just like us, is not interested in obtaining compromise solutions in the fabrication of partial dentures and who provides us with this part of the process chain. Ultaire™ AKP is used to fabricate metal-free partial dentures. What effect does this have on the digital workflow and what are the concrete advantages for the user and the patient? 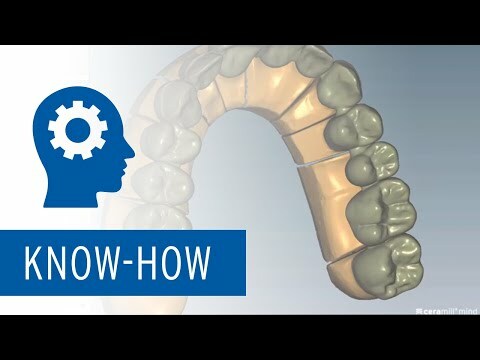 For the dental technician, the new workflow allows the bases of partial dentures to be designed directly and without any detours and then milled. Any casting is dispensed with, which minimizes sources of error and working times. The advantage for the patient is a metal-free restoration with very high wearing comfort. In addition, when compared to other metal-free materials used for partial dentures, the material is characterized by comparatively higher rigidity and extremely low plaque susceptibility. What exactly is implied by Amann Girrbach being a validated system partner of Solvay Dental 360™? 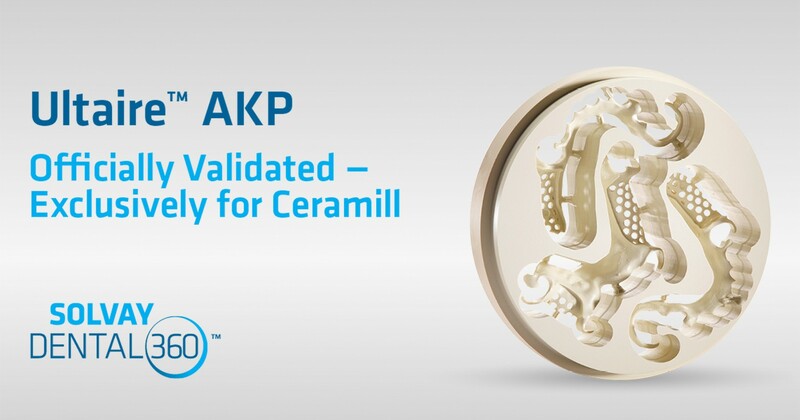 This means that Amann Girrbach has set up a complete CAD/CAM workflow for the production of partial denture constructions with Ultaire™ AKP and, together with Solvay Dental 360™, has already validated the entire process chain in advance. All the necessary design parameters, milling strategies etc. have been checked and are automatically stored in the software. This considerably simplifies the qualification process for Amann Girrbach users and it can be carried out directly by Amann Girrbach's Helpdesk in just a few steps. For an Amann Girrbach user, the question certainly arises as to which prerequisites must be fulfilled exactly in order to benefit from this cooperation. Which updates are necessary and to what extent do you offer training on the topic? The user must have a Ceramill Motion 2 and have installed the latest version of the Ceramill M-Part software module for individual partial denture frameworks. In addition, we offer mandatory online training to prepare every user for handling the material and the associated design requirements. The first user cases are supervised by us and approved. This way we want to give our customers additional support to be successful right from the beginning. At the moment Ultaire™ AKP is available in North America, U.K. and Germany and has regulatory approval 510K clearance, CMDCAS and EU. It is made in the U.S. under FDA and International Organization for Standardization (ISO) guidelines.